Cardiff City skipper David Marshall has won 14 international caps with Scotland. 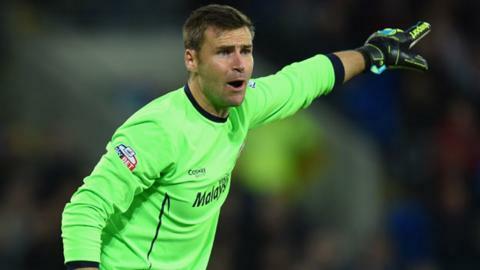 Cardiff City captain David Marshall insists there was no lack of respect when new manager Russell Slade arrived. Slade joined from League One Leyton Orient after the departure of Ole Gunnar Solskjaer, with Cardiff winning both games under their new boss. Marshall, 29, said media concerns over Slade's low-profile were unfounded. "Our dressing room is a pretty good group and there's certainly no disrespect to anybody coming in here," said the Scotland international. "The experience Russell had with Leyton Orient has been great. "If you're going to stay at a club for that length of time you're going to have something about you." Russell Slade managed Scarborough, Grimsby Town, Yeovil Town and Brighton before joining Cardiff City. Slade was in charge at Brisbane Road for more than four years, taking them to the brink of promotion in the 2013-14 season. But he had never managed at a higher level than League One when he was tasked with the job of trying to guide the Bluebirds back to the Premier League. However, a 2-1 win over Nottingham Forest in his first game in charge was followed by a 3-1 success over Ipswich - results that have seen Cardiff rise to 10th place in the Championship. The Bluebirds face Millwall at the New Den in the early kick-off on Saturday, with goalkeeper Marshall saying the team are determined to make it a hat-trick of wins under the new manager. "We [the players] know the buck stops with us," said Marshall. "We had a bad start to the season because of the players but we've reacted well. "It was down to us the bad start and hopefully we can continue on now and get ourselves back into the play-offs. "Every time you go there [Millwall] it's tough and they're coming off the back of a great comeback against Wolves. "So they'll be buzzing so we know how hard it's going to be, but we're on a good run so hopefully we can get a win."